Show your pet affiliation with these handsome dog and cat neckties! Choose your feline or canine affiliation or if you are a true animal lover, get the set! Each features a collage of a variety of colors and breeds and are great conversation-starters are parties or work events. 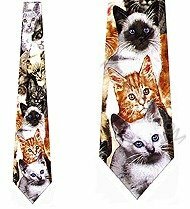 For more information about the dog and cat neckties, click here.